Melody and I have spent the past few weeks dealing with illnesses, bad weather, missed work (and school! ), and other nonsense, so I told her that Saturday would be an "Adventure Day" the likes we haven't seen in a long while. She was on board, so we turned in relatively early on Friday night in hopes of getting a great start on Saturday morning. We didn't do too badly. I was up at 7:45 a.m., and Melody got up shortly after that. We got ready and left the house at 9:30, which was later than I wanted, but when dealing with a pre-teen daughter, I'll take it. It was a cold morning, and knowing we would be inside and outside, we had to compromise a bit. That meant layers. Now we were ready. After we ate, we drove a few blocks down the street to the College Park Metro, and then rode down to the DC Convention Center at Mt. Vernon Square for the Washington Auto Show. 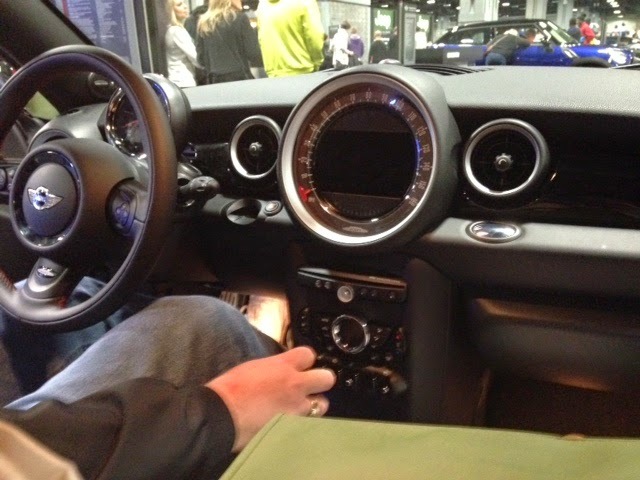 I love going to the Auto Show, and used to go every year. I don't go quite as much in recent years because it is so late in January. It used to be during the week between Christmas and New Years Day, and I loved going downtown during the Holidays. My guess it they moved it because so many people had other things to do during that week, and they figured they might have better attendance. That's just a hunch on my part, though. Melody came off the Metro feeling sick. She was very close to throwing up, and we made our way out into the fresh air at the top of the escalator. I was worried about her. She never gets sick like that (stomach-related) and has only thrown up once, ever. We guessed maybe it was something she ate at the Diner, or maybe motion-sickness from the Metro ride. Within minutes, she was fine, though, and after making sure she was okay going forward with our plans, we headed in. Entry was $12/adults and $5/kids under 12. We headed down to the first floor, and immediately headed over to "Camp Jeep," which offers free rides in a Jeep through an obstacle course. There were a lot of people in line, but it went quickly (like being in line for a roller coaster), and we were soon boarding a 2015 Jeep Wrangler Unlimited Willys Special Edition. I talked Melody into letting me ride up front in the passenger seat, and she rode in the back with a little girl and her father. It was a cool ride, including a rough ride across a bunch of logs, a climb up a steep hill and back down, then a ramp at a 30 degree angle, and finally, another hill. The guy driving said he had a 2-door Wrangler that he takes off-road a lot, and convinced me that I should do the same, and join a Jeep club in the area. We went through the rest of the car showroom fairly quickly, and by 1 p.m. we were ready to go find some lunch. It was cold out, but we were only a few blocks from Chinatown, so we decided to walk down there. 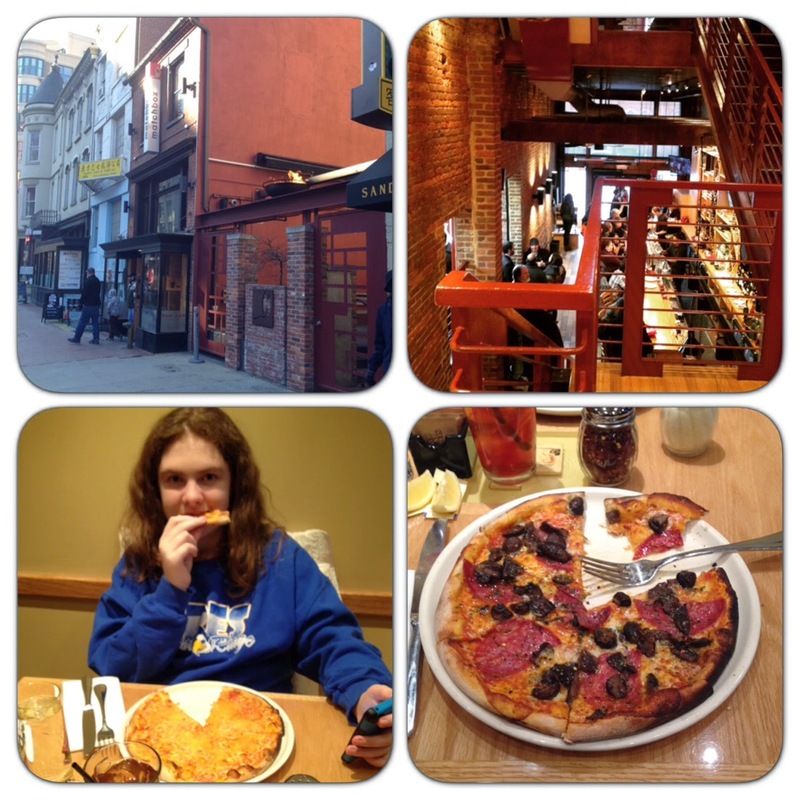 We found Matchbox, which I had heard about due to their great pizzas, so we gave it a try. It was crowded inside, but with only a 20 minute wait, we were seated soon enough. Melody and I both got small 10" pizzas. While Melody likes her plain cheese pizzas, I tried the spicy sopressata salami and wild mushroom. It was very good, probably one of the ten best pizzas I've ever had. Matchbox is a cool place. It is very narrow, but it's multi-stories with plenty of (tight) seating, and the service was great. We thought about going to one of the museums, since Melody was dreading the ride home on Metro, afraid she might get sick again, but it was getting late and we wanted to attend church at Grace Community at 5:30 p.m., so we headed home. It was a quick ride, and she made it without a repeat of her sick feeling. 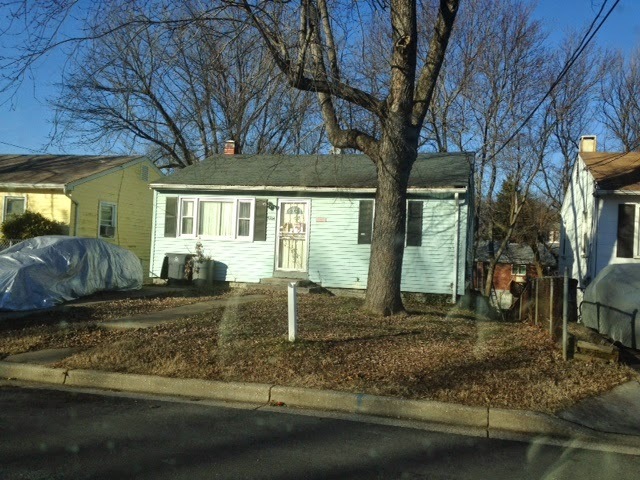 Since we were in the area, we decided to take a quick side trip past my first home, my parent's first house, in Riverdale, just off of Kenilworth Avenue near East West Highway/Riverdale Road. It's such a tiny little box of a house, with 2 bedrooms and 1 bath upstairs, and a small bedroom my father finished off in the basement. At one point, there were six of us living there (Mom, Dad, me, my sister, my uncle, and a family friend), and we all had to share one bathroom! We made one more stop, in Maryland City, at Sweet Frog, where we got some frozen yogurt for dessert (Matchbox's desserts are pretty pricey). While sitting in Sweet Frog, we noticed a brand-new Chipotle on the other side of the parking lot. That was a surprise, and it is the closest Chipotle to our home. We decided to run over and grab some dinner to go, and so, after church, we came home to a delicious Chipotle dinner. And that was the end of our Adventure Saturday. It was a lot of fun, and we had a great time.